I’ve been reading your blog for a while, found you through Goofygirl. I love your pics but this one is absolutely amazing. I have driven on that bridge a number of times but it’s cool seeing it from above. SO moving in a quiet a peaceful way. Wonder where the boat is going? Driving on that bridge is a bit of a ghostly experience (or at least a white-knuckled one)! Daunting, spiritual and complete simplistic beauty. I love this photo, Janet. That is a really awesome shot, Janet! This is wonderful, Janet. Mr. Marvel and I were married in Annapolis and lived in Glen Burnie for over a year, but I don’t think we ever drove over this bridge. What a shame. Thank you so much for appreciating what you have. What a phenomenal shot. It’s like a blueprint; surreal. That really is a wildly amazing photograph. It doesn’t look real. 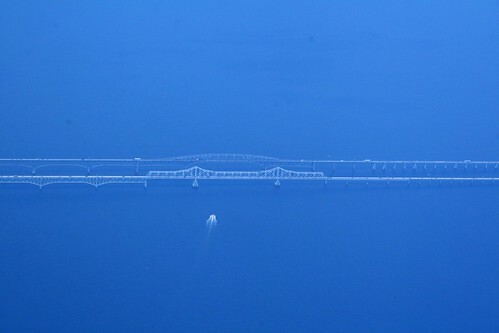 The bridge looks like it is spun from spiderweb as the distance and the surrounding blue make it seem so insubstantial.